I went back home for my sister’s birthday and Marti Gras, and I was faced with the dilemma of eating vegan in a Paleo household. Luckily, my mother is just a vegetarian version of Paleo (she skips the grains or dairy, but devours the eggs), and she usually gets some tempeh to experiment with for our dinners. While roaming the interweb of food blogs a little while ago, I had stumbled upon Fork & Beans’ Vegan Meatloaf Cupcakes, and they looked so yummy and creative that I decided that this was the perfect time to test them out. As always, I seem to be interpreting recipes so that I can translate them to fit my diet or someone else’s (i.e. : mi madre!) or switch up ingredients because I don’t have quite everything the recipes call for. This was just like all of those cases. However, in this case I was challenged with turing this vegan recipe into a vegan and quasi-paleo. In addition, I had less than an hour to whip up the recipe for the first time and head over to my grandmother’s for the family dinner I was making these for. Basically, I felt like I was throwing things in a bowl and hoping that they would taste good together, as I would try them minutes before actually eating them in my meal. To add to the crazy, my parents were trying to put together a New Orleans shrimp dish in the same amount of time, and all the hustle and bustle of the crazy kitchen added to my sense of panic. Despite all of the above circumstances, (and maybe because of them, who knows? 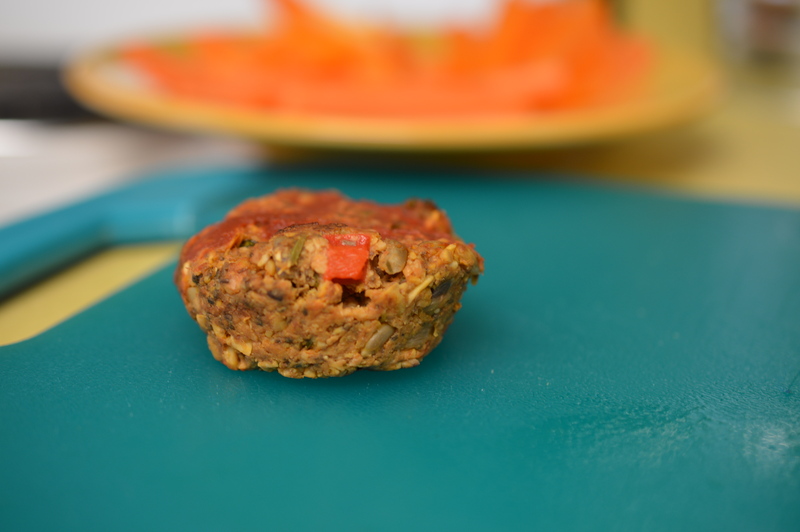 )I was able to turn out some great-tasting tempeh meatloaf. Even the meat eaters in my family tasted them and told me they liked it! That is the only stamp of approval that I need. That and also my happy taste buds. 2. Grind the tempeh in a food processor until it is broken up. This doesn’t take long, definitely no more than a minute or two. 3. Saute the garlic, shallots, and red pepper in coconut oil in a medium frying pan until the shallots become somewhat translucent and aromatic, about 5 minutes. Then, Take off the heat and let cool. 4. Combine the Worcestershire sauce, the cooked veggies, ground tempeh, cooked veggies, dried herbs, and tomato paste in a medium to large mixing bowl. 5. Add the chia “egg” mixture, then add remaining ingredients (sunflower seeds, coconut, parsley). 6. Scoop the mixture into a muffin pan, greased with coconut oil, gently pressing down. Mine filled up 11 of the spots. These will not rise, so don’t worry about leaving too much room at the top–just don’t press down so hard that the loaves become super dense. 7. Mix the tomato paste and syrup in a small bowl and spread over the tops of the loaves. 8. Place the tray in the oven for about 20 minutes or until fully cooked in the middle. 9. Let the loaves cool for at least 5 minutes, then they are set to serve! I hope you enjoy these little meat(less) loaves. I found them extremely satisfying, especially because sometimes I miss the texture of meat. If that is your fancy, I totally recommend trying them out! They also warm you up and make you feel happily full. I hope you have a give them a try, and thanks for stopping by!